Kikay Corner > beauty > 5th Phil-Cosmetics Expo 2012: Pilipinas ang Ganda Mo! 5th Phil-Cosmetics Expo 2012: Pilipinas ang Ganda Mo! This year, the Expo has also opened its doors to the public who are interested in breaking into the business of beauty through its seminars and its exhibitors who offer opportunities other than big discounts on their product lines. The perfect chance to scout the best business venture, if you ask me. Who knows you might even find sterling silver jewelry business opportunity during the exhibit. The event will also showcase hair and make-up and nail art competitions and the prestigious Mr. & Ms. Cosmetics 2012 which discovers new talents that represents and supports the objectives of the industry. 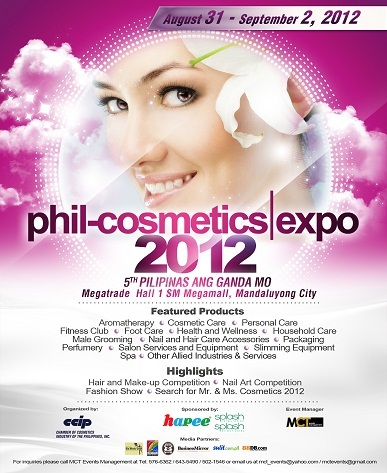 For more information, inquiries or reservations about the 5th Phil-Cosmetics Expo 2012, please contact Jonathan Roxas or Emer Dela Cruz of MCT Events Management, the marketing arm of the Expo, at telephone numbers 5766362, 6435490, 3992935 and 502 1546.